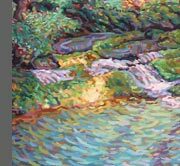 Anne Way Bernard - Original oil paintings, including portraits, landscapes, still lifes and pet portraits. Anne Way Bernard is an artist living in the Blue Ridge Mountains of Virginia. Her oil paintings represent a range of subject matter including portraits, pet portraits, landscape and still life, and some recent experiments with the abstract.